DESERT STORM VETERAN and MORE HAT - Direct embroidered in multiple locations, brass buckle closure. Desert Storm Veteran Hat with 4 Ribbons on the front, Proudly Served on the bill, Desert Storm on the back with Veteran on the closure. Well made, quality cap. Veteran owned and operated business. 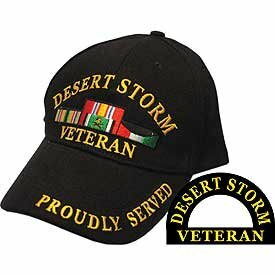 Desert Storm Veterans love this Hat as a favorite, GREAT GIFT IDEA!! HatnPatch Is a Veteran Owned and Operated Business - Retired Marine - We Ship Your Order Within 24 Hours And Usually The SAME DAY!